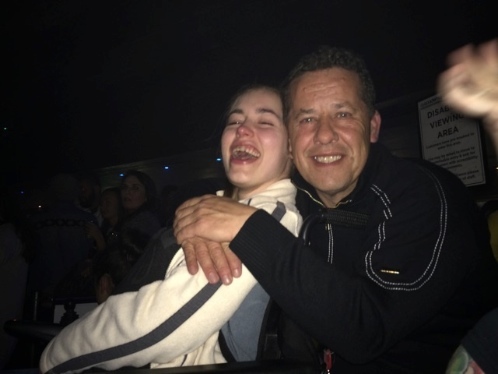 This guest blog has been written by Chris Wood, father of two children, both of whom are power chair users. He wrote it in response to the recently published report into airport experiences of disabled travellers. He is pictured here with his daughter Tayla. I am not disabled but my children are. They are now both in their twenties, and want to travel and they do. Most forms of public or commercial travel by land or sea are easily accessible, alas air travel is not. I have travelled with them, their friends and carers/PAs, therefore I can see and encounter all their problems and that is my perspective. I would like to approach this from a different angle. I believe that some of the problems in and around the Airport Experience lead to the same place; that is the aircraft itself and its current limitations. Trains, cars, buses, boats/ferries etc. have very few problems, as all these modes of transport have invested and adapted. There is always room for improvement, but travelling over land or sea are a breeze compared to air travel. Both my children are in electric wheelchairs, and they are unable to sit in a normal aeroplane seat as they both need additional seating (thoracic) support. No matter how many cushions are stuffed in and around their body, or bits of wood put under their feet, their journey will be uncomfortable and stressful for them. Aircraft have no accessible toilets, so in the case of my daughter, who is 23, I carry her and place her on the toilet, and position myself on my knees on the toilet floor while I hold her in place – and the door remains open. This is how everyone does it: how dignified is that?! Neither can they use the aisle wheelchair, as there are no side supports, so they would fall off. I lift them to their seat: thankfully most (not all) reserve a seat near the cabin door, otherwise it’s Row N Seat 7… and that’s an Olympic sport!! The Eagle Hoist has helped some of those who have enough upper body strength to sit comfortably in an aircraft seat for the duration of the journey. There is still the toilet to consider; and where the aircraft needs a swift turn-around, they are not so accommodating so without undermining its superb design and the place it has in air travel, it does have limitations. In an ideal world and if the airlines had invested and adapted, there would be a place on the aircraft where at least two wheelchairs could be clamped in, next to the PA/carer in a standard airplane seat, and away we go: quite simple really when you put it like that! In one fell swoop, I have eliminated a lot of problems. The ticket would have been purchased specifically for a wheelchair space; there is no requirement for assistance from here on in. In the boarding lounge, wheelchair tickets can be boarded first, can drive to their space and be simply clamped down by a trained member of cabin crew in under 60 seconds. Additionally, the internet is full of stories of airlines breaking electric wheelchairs during handling and in the hold: this problem too would be removed. I will consider the effect on the ticketing and airports if the ideal world was in place in due course, but for the moment I will focus on why (as far as I can see) this ideal world is resisted by airlines and why perhaps they are happy to pay fines and let the current Heath Robinson process ensue. Ironically, it is the airports and their staff that have to resolve the carnage when things goes wrong – and that seem to be where the problems lie. The reality as I see it is rather different. Is lack of financial investment really the root cause? The general consensus of opinion from all those I have spoken to in and around the industry, is that there is a lack of financial investment, and general apathy about even considering investment. When you consider that more than £300 million has been poured into the new airbus, and paradoxically air tickets are being sold for less than £10, it is excruciatingly hard to see that premise. Others tell me that the necessary adaptation is technically difficult – although not impossible. Theresa May recently announced a £350 million fund to invest in new technologies in the air industry. I have asked my MP, the Prime Minister and also Lord Ahmed in his role as Parliamentary Under Secretary of State for Transport (Minister for Aviation) if 1% or even less could be used to invest in a safe solution to allow wheelchair users to travel by air in their chair. I have also asked Andrew Haines at the CAA if the windfall funds from the fines levied when airlines fall foul of the law could be made into a cash prize fund. This prize fund should be offered to universities, colleges etc. to resolve the issue. I believe, as do many others, that students would swarm all over this, not only for the prize, but also for the credibility such a project would bring. There are enough creators and innovators out there to move an out-of-date travel industry into 2016 and a new age. How would airports and facilities management organisations benefit? So now let’s look at how the airports, ticketing etc. would benefit from this ideal world for those that want to travel in their chair, as they simply cannot live their life any other way. Please remember this is a large group of people: as well as those like my two disabled children, there are injured servicemen and women, elderly people who have suffered life-changing strokes and so many more – surely these people deserve attention from our airlines, rather than being ignored. Why should their lives be made more difficult and stressful? When I take my car on a ferry or even through the Channel Tunnel, I am asked several questions on line, the most obvious one being the make and model of the vehicle. It is, I am sure, hard to find a car that is not on their database and therefore all the necessary information appears speedily in drop-down boxes. So why when you book a ticket as a wheelchair user can’t a similar process be put in place? A list of electric wheelchairs which I doubt would be as big and diverse as a range of cars. A system like this could eliminate so many security and booking issues – notably the type of battery. Typically, my daughter is asked on three or more occasions what sort of battery is in her electric wheelchair. I am currently looking into this and believe I have the right contacts and knowledge to compile such a list. The report on airport experiences quite rightly covers all areas of disability, and I will confess to being less knowledgeable on some. But what stands out for me is the increased training needed for assistance staff, who need to help people with various disabilities: this is a tough ask. I encounter disabilities on a regular basis, yet I am only proficient in the areas where my children are involved. It strikes me that a company would not employ an engineer to produce the company accounts, nor would they employ an accountant to be an engineer, so I have to ask why airports do not employ staff who use a wheelchair to assist with a wheelchair user, someone who has experience in autism, etc. Can you imagine the confidence the passenger will have, knowing that the person assisting them also understands their needs? This is not rocket science. I felt the report was exceptional and long overdue, but the changes must start to happen now. It is easy enough to produce reports and have meetings about meetings etc. but we need action. I suggested at the beginning that the airlines are the problem which is why airports, staff and passengers are having to pussyfoot around their resistance to invest in adaption and innovation (unless it is for business class, of course!!). Ultimately, they are the cancer but resist the cure, and without this, any airport will be forever chasing their tail. I understand that flying from an airport in the UK and most European and American cities is as good as it gets. For most disabled travellers, it is “put up and shut up”, but it can be much worse if you land in some more basic international airports. I understand this is a global project, but it is a total waste of time if we have to wait for everyone to comply at the same time. Someone has to lead the way. I feel that airlines should be fined more heavily, as they seem to content to pay the fines currently levied. Or perhaps it needs another method: airports, government, industry all leaning on these airlines to invest, create and innovate for the disabled traveller. Finally, I am not so unrealistic as to believe that any adaptation for wheelchair users will happen overnight; indeed I would suggest that it will be the next generation of wheelchair air travellers who will benefit, as and when the airlines change. My campaign only started earlier this year, but has started to take over my life, such is the reaction I have received. I am also in touch with All Wheels Up who have an amazing campaign in the USA, which is doing incredible things. So many wheelchair users will NOT fly, they have told me they are NOT welcome, the indignity is too much to handle. Some of these people used to spend a lot of their income on air travel, yet they have been discarded as they do not fit in – that can’t be right!! You can join the debate by contributing your experiences and opinions below! This article was sourced from the website Independent Living UK (full copy) and the original article can be found at A fresh take on accessible air travel for wheelchair users.